This week was Health & Safety Week across Europe, with many companies and businesses taking part and trying to encourage a safe working environment for their employees. The Chris Mee Group contributed to health and safety in and outside our workplace by running Fire Safety In The Home briefings and presentations, inviting all staff to attend. We learned about various fire dangers in the home, and how easily a fire can start and how it can spread. We looked at issues such as kitchen fires from cookling oil or faulty cookers, electrical fires from unsafe appliances and sockets, and even carbon monoxide and the dangers posed by this poisonous gas. The session concluded with a look at fire fighting tools – fire extinguishers and fire blankets, but also warning systems such as smoke alarms and carbon monoxide detectors. We were shown the various types of fire extinguishers (water, foam, CO2 and dry powder) and what type of fire each extinguisher should be used on. 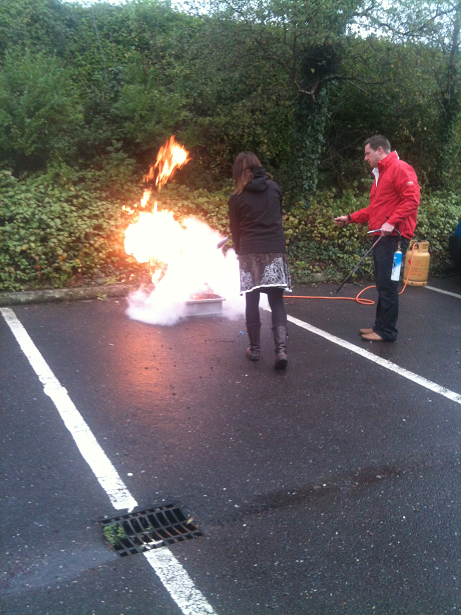 The briefing finished with everyone getting a practical demonstration on using a CO2 fire extinguisher and putting out a real fire. The Chris Mee Group also encouraged a healthy lifestyle by offering fruit, yoghurts and health drinks to all staff this week, and also provided information on healthy eating and healthy lifestyle activities on display in the canteen and office.